We go through the different styles available on the market and the wide range of features available on each type of fridge and freezer to help you make those important decisions about your next kitchen appliance. 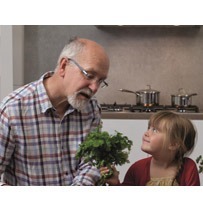 If you haven’t decided what size of fridge or freezer you need either then our jargon-busting capacity guide will help you evaluate which model if going to work best for you at home. We have created a collection of American style fridge freezers that include a range of styles, door opening and storage options to allow you to choose exactly what will suit your lifestyle. Choosing an American style fridge freezer of course requires more space in the home than a standard fridge or freezer model. They are designed to stand out and make a statement with steel, black or white colour finishes, bold door handles and recessed door opening details and extra features like freezer drawers or ice & water dispensers. Deciding which model will work best for you depends on how you shop, what you store most of in your fridge and freezer and what extra features you are looking for. The most straightforward set up is a side by side model like the PC52. You will get a tall fridge on the right and a tall freezer on the left. Open either door for easily accessible food storage and flexible shelving that can be adjusted to the type of food you keep in the house most often. The side by side style limits bending down as you can see everything in an upright position. There is also less need to pull out freezer drawers to investigate the contents as much of the freezer area is made up of open shelving, giving you easy access to frozen food whenever you need it. 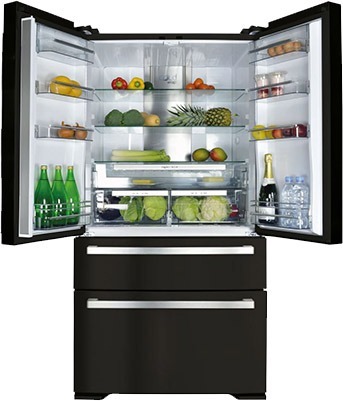 The PC71 is similar in style with side by side opening but also adds an additional ‘home bar’ access to let you conveniently reach milk, juices or even wine from inside the fridge door without having to open the appliance. 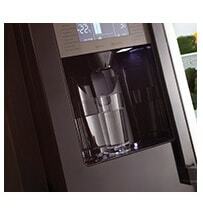 There is also a built in ice and water dispenser on this model to conveniently bring chilled, filtered water and ice to your kitchen whenever you need it. The next style is referred to as ‘French door’ and features a large fridge at the top with a left and right hand opening double door. 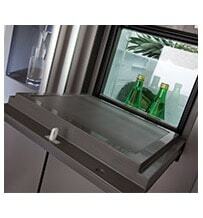 Beneath this are two pull out freezer drawers that really revolutionise the way you access your freezer compartment. This style is perfect for families who want plenty of fresh food storage space and need easy access to everything inside their fridge. The doors open wide for easy unloading when you get the shopping home and for at a glance pre-dinner browsing. The freezer drawers on these models, which include the PC84 & PC870 in our range, pull out smoothly on runners so you can see everything inside that compartment and quickly lift out the item you need. This is perfect for people who easily forget what is at the back of the freezer, want better frozen food organisation and easy access to long term food storage. The PC84 is also our slimline American style model, allowing you to fit a substantial, statement appliance into smaller kitchen spaces. If you are short on space but want to achieve the American style look, this is the model for you. The third style we make comes with four door opening. It has two side by side doors to access the fridge at the top and two side by side doors to access the freezer at the bottom. The immediate convenience of this style is obvious as you can access any quarter of the appliance without having to open wider doors fully, losing cool air in the process. The four doors give you direct access to the part of the fridge or freezer that you need and the streamlined handles on the PC900 or recessed door openers of the PC800 run the height of the appliance for a completely streamlined and stylish finish. Ranging from our slimline PC84 to the premium PC900, there is a variation in sizes of American style fridge freezers to suit your space. One consideration to take into account is that these types of coolers are wider than traditional fridge, freezer or combination models. Some can be over 90cm wide, which may take up a substantial amount of wall space in your kitchen. 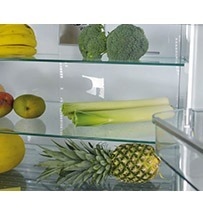 There is also the matter of door opening to consider, with a 10cm gap being required either side of the appliance to allow full operation of the doors to your fridge and freezer. If you are aligning appliances, bear in mind that an American style model can be typically 70cm or more in depth to accommodate the door cladding and handles. This could impact upon any breakfast or dining space in the centre of your design. Be sure to measure your space before purchasing, including doorways and hall widths to make sure you won’t have any problems when it comes to delivery. It is true that you will be able to store the whole week’s shop and much more inside one of these refrigeration giants. 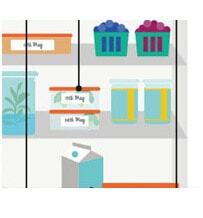 Take a look at our refrigeration capacity guide for specific information. One of the main benefits of choosing a model from the American style range is all the extra features that are available on these premium appliances. All our American style fridge freezers feature ‘fast freeze’, sometimes referred to as ‘super freeze’, for safely and effectively bringing fresh food down to a long term storage temperature quickly. When you add fresh food to your freezer the warmer temperature could potentially compromise the frozen storage of food already stored there. The fast freeze function reduces the temperature of the freezer compartment temporarily to bring any new additions down to a frozen temperature quickly to maintain the quality of all your food stored there. Another common feature in the range is the open door signal. This will alert you with an audible signal if you leave the fridge door ajar or open for a period of time where the internal temperature of your appliance will be compromised. We think this is an important feature as it helps you to prevent food spoiling and save money on energy bills by ensuring that your appliance is closed properly. Where you see the feature ‘Holiday mode’ there is an additional function that can be selected for periods where your fridge may not need to be in use. 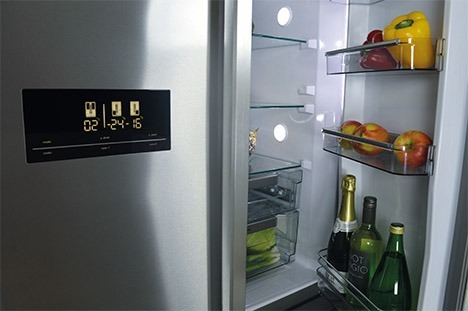 This function maintains the settings for your freezer but reduces the power used by the fridge by increasing it to a maintenance temperature of around 14°C. This is ideal if you are going away, and have remembered to cancel the milk, because you won’t be using it anyway and it will save energy and money on your bills. Our American style fridge freezers also have extremely low noise levels, which is important in modern, open plan living spaces. Averaging in the low 40dBAs, their noise level is equivalent to that inside a library or of a bird call. Shhh! Some of the internal features of these models have been specifically designed to help you store food and keep it fresher for longer. Specialist drawers like meat storage, humidity controlled for fruit & vegetables and lidded dairy compartments are all designed to limit, allow or prohibit air flow and maintain controlled temperatures to create the perfect environment for your shopping. 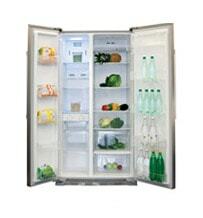 The PC880 fridge freezer features our PureFresh technology to take freshness one step further. This model has a built-in charcoal filter that works like traditional bicarbonate of soda to neutralise and filter bad odours from the fridge cavity. 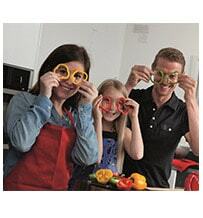 This is perfect for strong cheese lovers! If you have ever been given a bottle of warm wine by a dinner guest or run out of cool drinks in the middle of a party, the Q drink feature is definitely for you. Q drink is a clever timer that has been created to specifically work alongside the fast chilling of beverages in the freezer compartment. Forgetting a bottle of wine and leaving it to go slushy in the freezer is a thing of the past as the Q drink timer will alert you with an audible alarm when your refreshing beverage is ready to pour. One of the innovative features on the PC900 is a flexi storage zone that can be selected to run either as a fridge or freezer compartment. This is ideal for when you need extra fridge space for party food or at Christmas, when you have done your week’s meal prep or for when you take advantage of a special offer in the supermarket. Whichever features you choose, we are sure that there is one to enrich your user experience with convenience, extra functionality and safer food storage. 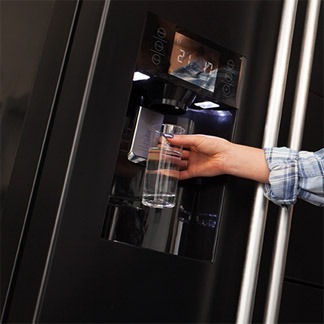 If you choose a fridge model with an inbuilt water and ice dispenser, you will need to consider the location in your kitchen for installation. The appliance will need to be close to the water supply and with easy access to pull the appliance out to change the filter every 6 months or so. We have included some handy installation tips in our buying guide to get you and your appliance up and running quickly.